Premium Compatible Label Tapes for the Brother P-Touch H101TB printer. The Brother P-Touch H101TB is a monochrome label printer that works on thermal transfer technology. This label printer has a very small footprint and is suitable for home or small office use. The Brother P-Touch H101TB weighs just 390 grams which makes it quite lightweight and highly portable. This label printer has a dimension of 11 cm x 20.7 cm x 5.9 cm (HxWxD). This label printer has a display resolution of 1 line x 12 characters and features a two line printing of the labels. It can produce a good amount of styling and effects. This label printer uses an ABCD keyboard which has 54 keys and has a print speed of 20 mm/sec. This label printer is compatible with TZe Brother P-Touch H101TB Label Tapes. The Brother P-Touch H101TB can print 9 repeated copies and uses black and white Brother P-Touch H101TB Label Tapes. This label printer has a maximum resolution of 180 dpi. This printer can print with a maximum printing width of 9 mm and maximum printing length of 300 mm. The Brother P-Touch H101TB printer works on thermal transfer technology and is ideal for home or small offices. This label printer is quite lightweight and is highly portable. This label printer has a good printing speed and a built-in paper cutter. This label printer can produce professional looking and good quality results. Also, the option of print previewing is present. But the problem with this device is that it has low maximum resolution and less connectivity options. Q. 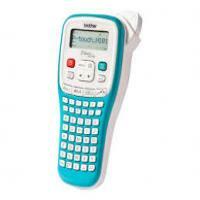 Which Brother P-Touch H101TB Label Tapes are suitable for the label maker? Q. What is the maximum printing speed and the maximum print resolution of Brother P-Touch H101TB label writer? A. The maximum printing speed of this label writer is 20 mm/sec. The maximum print resolution of the printer is 180 dpi. Q. What are the key features of the Brother P-Touch H101TB label printer? What are the built-in devices supported by the Brother P-Touch H101TB label printer? The built-in devices supported by the label printer are preview screen, character keyboard and cutter. Q. What are the dimensions of the Brother P-Touch H101TB label printer? What is its weight? A. The label printer is 11 cm in width, 20.7 cm in depth and 5.9 cm in height. This label printer weighs 390 grams. Q. What is the display resolution of the Brother P-Touch H101TB label printer? What sizes of Brother P-Touch H101TB Label Tape does the printer support? A. The display resolution of the printer is 1 line x 12 characters. The size of the label tapes supported by the printer are 0.6 cm, 1.2 cm, 0.9 cm and 0.35 cm. Q. I want to print the labels vertically. How can I do this? A. To print the labels vertically, Press the ‘F’ key. Continue pressing the ‘F’ key or press the left arrow key or the right arrow key until ‘Style’ is displayed. Then, press enter. Press the left arrow key or the right arrow key until ‘Vertical’ is displayed. Press the Enter key to apply the settings. Now continue typing. Q. Stripes appear on my label. Why? A. Stripes appear on the label as you have reached the end of the Brother P-Touch H101TB Label Tape. So you can replace the tape cassette with a new one. Q. My machine is displaying ‘Text Lmt’. Why? A. The machine is displaying ‘Text Lmt’ as the text length exceeds the selected label length or the selected Auto Format setting length. This error can be corrected using one of the following methods - change the Margin setting to Narrow or Half, change the Length setting to Auto or reduce the size of the characters. Q. The ink ribbon got caught in between the Brother P-Touch H101TB Label Tape layers and came out of the machine. What can I do to resolve this issue? A. This problem arises when you install the tape cassette leaving the ink ribbon loose or by pulling the printed label out by hand. If the ink ribbon has not separated from the cassette, the issue can be fixed by winding the toothed wheel and reeling the ink ribbon. Also make sure to wind the toothed wheel in the correct direction. If the ink ribbon becomes separated, you cannot reel the ink ribbon. If still the problem persists, replace it with a new tape cassette. Q. What do I do if the Brother P-Touch H101TB Label Tape does not cut well? A. If the tape cannot be cut cleanly or the cutter blade becomes blunt after repetitive use, replace with new cutter unit.